Panforte Bianco...a Holiday tradition. Panforte...a traditional Italian cake whose roots go back to the 13th century in Siena Italy. Siena is regarded as the Panforte capital of the world. Panforte translates to "strong bread" referring to its piquant flavor. 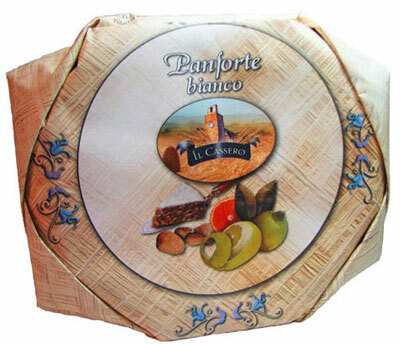 Le Logge Panforte Bianco is a dense mix of candied fruits, almonds, spices & honey. Dusted with powdered sugar, Panforte Bianco is the perfect ending to a great Holiday meal...Le Logge Panforte Bianco is simply the best in its class! Le Logge...master bakers preserving the flavors & aromas of the past...a Panforte that distinguishes the region. Le Logge uses only the finest ingredients to produce this Panforte Bianco, Enjoy!!! Order Now for the Holiday Season...Limited Availability!!! Artigianale / Handmade in Siena, Italy.